Charlie Kaufman and Duke Johnson’s stop-motion-animated drama depicts one day (and mostly night) in the life of Michael Stone (voice of David Thewlis), a motivational author stopping over in Cincinnati to deliver a speech. Michael is unhappy — we get a few hints of a troubled home life, and then there is his listless demeanor. Everybody he encounters looks and sounds the same. But later at the hotel — the Fregoli Hotel, a joke for psychiatrists — he meets a young woman named Lisa (voice of Jennifer Jason Leigh), and the encounter lifts him from his funk. Or does it? Typical of Kaufman’s existential examinations, the truth of the matter is a bit slippery. Those are primarily visual cues; oddly enough, the use of one voice (courtesy of Tom Noonan) for all the characters except Michael and Lisa wasn’t nearly as distracting. But I also drifted in and out of the film because of its singular focus on Michael: At times he was pitiable and more emotionally accessible, but as the film played out, he grew less sympathetic and more tiresome. (And truly: Another story about a middle-aged, middle-class white guy suffering some poor-me crisis?) But that’s also the point: Michael is both the victim and perpetrator of his own emotional isolation. 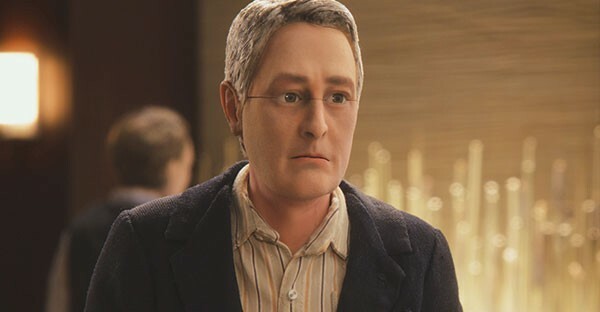 Anomalisa is a tidy 90 minutes, while remaining open-ended enough to provoke lively post-screening discussion. The film is more downbeat than not, though there are a few jokes and one sequence that is “Kaufmanesque.” Mind the sunken conversation pit!